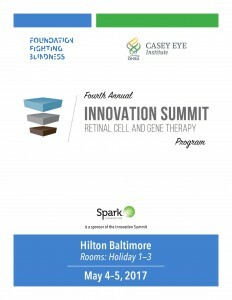 For anyone wanting to know about the latest clinically focused research for inherited retinal diseases (IRDs), the Innovation Summit for Retinal Cell and Gene Therapy was the place to be. In its fourth year, the meeting is becoming the world's most comprehensive overview of the promising research underway for emerging IRD treatments. Hosted by the Foundation Fighting Blindness and Casey Eye Institute (Oregon Health & Science University), the Innovation Summit featured 44 information-packed presentations from research and industry leaders. Summit co-hosts were Casey's Mark Pennesi, MD, PhD, and Trevor McGill, PhD, and Patricia Zilliox, PhD, chief drug development officer of FFB's Clinical Research Institute. More than 250 researchers and industry leaders were in attendance. Spark Therapeutics was a sponsor of the event. Tadao Maeda, MD, PhD, with the Japanese company Healios KK, discussed plans for a clinical trial for a dry age-related macular degeneration (AMD) therapy of retinal pigment epithelium (RPE) developed from induced pluripotent stem cells (iPSC, stem cells derived from blood or skin). RPE provide support for photoreceptors and degenerate first in AMD. The Neural Stem Cell Institute (NSCI) is developing an RPE therapy for dry AMD in which the stem cells used to make the RPE are derived from adult human retina. Sally Temple, PhD, NSCI's scientific director and innovator in adult stem-cell research, presented an overview of the emerging therapeutic approach. Regenerative Patch Technologies has launched a Phase I/IIa (safety-oriented) clinical trial for an RPE therapy, derived from human embryonic stem cells, on a scaffold (parylene membrane) for dry AMD. The scaffold is designed to properly orient, and enhance the survival of, RPE in the recipient's retina. The company's Dennis Clegg, PhD, and Jane Lebkowski, PhD, discussed the treatment's innovative technology and trial's complexities and challenges. Kapil Bharti, PhD, at the National Eye Institute, one of the federally funded National Institutes of Health, discussed plans for a clinical trial for a dry age-related macular degeneration (AMD) therapy of RPE developed from induced pluripotent stem cells (iPSC). Cell Cure Neurosciences (Israel) has launched a Phase I/IIa (safety-oriented) clinical trial for its RPE therapy for dry AMD derived from human embryonic stem cells. Eyal Banin, MD, PhD, Hebrew University-Hadassah Medical Center, said that no serious adverse events have been reported for the first five participants. The University College London, in collaboration with the University of California, Santa Barbara, is conducting a Phase I/II clinical trial for its RPE therapy, derived from human embryonic stem cells, for wet AMD. The treatment includes a scaffold to orient, and promote survival of, the RPE. Peter Coffey, PhD, director of the London Project to Cure Blindness, said that though the small trial is focused on safety, some modest vision improvements have been observed. ReNeuron, a biotech in the United Kingdom, is conducting a Phase I/IIa clinical trial at Massachusetts Eye and Ear Infirmary (MEEI) for a therapy of human retinal progenitor cells designed to restore vision for people with retinitis pigmentosa (RP). Eric Pierce, MD, PhD, the study's principal investigator at MEEI, reported that six people with advanced vision loss have been treated thus far with no serious adverse events related to the therapy. Maria Grant, MD, at the Indiana University School of Medicine, reported on an emerging iPSC-derived therapy to facilitate repair of vasculature in retinal diseases such as diabetic retinopathy. Mandeep Singh, MD, PhD, at Johns Hopkins University, reported on cell to-cell fusion and cell-to-cell transfer of cytoplasm— the liquid contents inside a cell — between transplanted and host retinal cells. The transfer of cytoplasm may have therapeutic benefits beyond the function of the transplanted cells. Donald Zack, MD, PhD, at Johns Hopkins University, and his team found that the FDA-approved cancer drug sunitinib supports survival of both photoreceptors and retinal ganglion cells. Promoters work like gas pedals for the expression of protein by a gene. In gene therapy development, selection of promoters to express the optimal amount of protein in the right cells is an important consideration. Elizabeth Simpson, PhD, the University of British Columbia, discussed her work with minipromoters, which may provide optimal gene-therapy expression without off-target effects. Most emerging gene therapies are delivered through an injection underneath the retina (subretinal). While this approach gets the treatment close to the targeted cells, it is invasive, especially for a diseased retina. Leah Byrne, PhD, University of California, Berkeley, is developing a gene-delivery system (using an adeno-associated virus or AAV) that can be injected into the vitreous, the gel in the middle of the eye. While intravitreal injections are safer, the challenge is to get the treatment to the cells that need it. Shannon Boye, PhD, University of Florida, is evaluating intravitreal AAV gene therapy delivery in large animal models with the goal of identifying an option that can be used in human gene therapies. Blue cone monochromacy is a retinal disease affecting cones, causing severe impaired (limited) color vision and poor responses to light. William Hauswirth, PhD, University of Florida, presented his successful study of a gene therapy in a mouse model of the condition. William Beltran, DVM, PhD, University of Pennsylvania School of Veterinary Medicine, achieved success (protection of rods) with an AAV gene therapy for a canine model of RP caused by mutations in rhodopsin (RHO). The treatment works by "knocking down" both the normal and defective copies of RHO and replacing them with normal copies. Gus Aguirre, DVM, PhD, University of Pennsylvania School of Veterinary Medicine, delivered a gene therapy to restore cone vision and preserve rod vision in a canine model of Leber congenital amaurosis (LCA) caused by mutations in NPHP5. The treatment was effective for at least 2.5 years. Optogenetics is the use of gene therapy to bestow light sensitivity to a retina that is no longer providing vision. Because people who are completely blind have lost all of their photoreceptors, optogenetic therapies often target surviving ganglion cells. Deniz Dalkara, PhD, Institut de la Vision, discussed how GenSight is developing an optogenetic therapy, which is designed to work safely and effectively in natural lighting conditions. The GenSight approach is more advanced and optimized than many other emerging optogenetic options. Kevin Gregory-Evans, MD, PhD, University of British Columbia, presented his early, ongoing work in ex vivo gene therapy in a mouse model of X-linked retinoschisis. People with the condition, and the animal model, have a lack of RS-1 protein due to a genetic mutation. The treatment approach involves the extraction of mesenchymal stem cells from the patient, treating those cells so they produce RS-1 and then transplanting them into the patient's retina. Jean Bennett, MD, PhD, University of Pennsylvania, discussed Regenex's progress with an emerging gene therapy for wet AMD, which works by blocking the growth of leaky blood vessels that cause vision loss. Unlike current therapies that require regular intravitreal injections, one injection of the Regenex therapy shows promise for persisting several years. Thanks to success in animal models, the company is planning a Phase I clinical trial. Odylia Therapeutics is a new nonprofit focused on funding translational and early clinical research for ultra-rare retinal conditions — those that affect less than one in a million people. Scott Dorfman, chief executive officer, said the nonprofit's first project is a gene therapy for LCA caused by mutations in RPGRIP1 under development at Massachusetts Eye and Ear Infirmary. Isabelle Audo, MD, PhD, Insitut de la Vision, discussed the status of Sanofi's Phase I/IIa gene therapy clinical trials for people with Usher syndrome type 1B and Stargardt disease. Twenty-four patients have been treated in the Stargardt disease study, which is taking place at Casey Eye Institute (OHSU), Institut de la Vision, Bascom Palmer Eye Institute (University of Miami), University of Iowa, and Cullen Eye Institute (Baylor College of Medicine). Nine people have been treated in the Usher syndrome type 1B study at Casey and the Institut de la Vision. No efficacy has been observed thus far in these safety-oriented, dose-escalation human studies. Spark Therapeutics used a luminance mobility course to evaluate vision changes of patients participating in its RPE65 gene therapy Phase III clinical trial. Katherine High, MD, president and chief scientific officer at Spark, showed videos of improved patient navigation of the course after treatment. The course is a reliable, reproducible outcome measure for diseases in which vision improvements are difficult to capture using standard tests. Spark is seeking FDA approval for the gene therapy after its successful Phase III study. Tomas Aleman, MD, presented an overview of a Phase I/II choroideremia gene therapy clinical trial at Scheie Eye Institute (University of Pennsylvania). The treatment is being developed by Spark Therapeutics. Nine people have been treated thus far in the safety-oriented trial. No significant vision improvements were observed at the early, six-month juncture. Byron Lam, MD, Bascom Palmer Eye Institute (University of Miami), presented updates on gene therapy for Leber hereditary optic neuropathy (LHON) and choroideremia. LHON affects mitochondria in cells of the inner retina. Bascom Palmer is conducting a Phase I clinical trial for LHON. The trial is treating patients with varying stages of disease - chronic, acute, and pre-symptomatic - with varying doses. Six of nine participants have been treated in the chronic arm with some showing vision improvement. Six patients have been treated in the first year of the Phase II gene therapy trial for choroideremia. Overall, vision has been relatively stable for those treated. Jose Sahel, MD, University of Pittsburgh School of Medicine and Institut de la Vision (Paris), reported on GenSight's clinical trials for LHON gene therapy. Some vision improvements were reported in the Phase I/II study (21 patients), which took place in Paris. The Phase III trial is underway at multiple sites in Europe and the U.S. Dr. Sahel also reported on the success of rod-derived cone-viability factor (RdCVF) for slowing degeneration for RP in preclinical studies. He and his collaborators are now moving the treatment toward a clinical trial. Clinical researchers at the University Hospital Tuebingen in Germany launched a Phase I/II clinical trial for people with achromatopsia (CNGA3 mutations), an inherited retinal disease affecting cones, thereby causing day blindness and impaired color vision and perception of detail. Dominick Fischer, MD, PhD, the study's principal investigator, reported that nine people have been treated thus far — three each receiving low, medium, or high doses — in the safety-oriented study. Tami Smith, MD, head of global medical affairs at Spark Therapeutics, provided an overview of ID Your IRD, a genetic testing program provided at no cost to patients with conditions such as LCA, RP, choroideremia, and those affecting the outer retina. Genetic counseling services are also available through the program at no cost. Uveitis is a group of eye diseases that cause inflammation, and potentially tissue destruction, of various parts of the eye. Uveitis can be caused by a range of factors (infectious or non-infectious), and vary in severity. Paul Yang, MD, PhD, Casey Eye Institute, discussed the potential for uveitis to occur as an adverse event with retinal gene therapies, because of immune-system intolerance. While most AAV-based gene therapies in clinical trials have performed without serious adverse events, Etiena Basner-Tschakarjan, MD, PhD, at the Children's Hospital of Philadelphia, discussed strategies for mitigating potential immune responses to them. She said that viral particles from AAVs persist for several years in the retina. By delivering gene therapies more efficiently — using smaller doses to achieve efficacy (improve transduction) — the chance for an immune reaction might be reduced. Conditions such as age-related macular degeneration, diabetic retinopathy, and uveitis can cause damaging retinal and ocular inflammation. Christian Ildefonso, PhD, University of Florida College of Medicine, reviewed a gene therapy — an AAV that delivers copies of the M013 gene — to reduce retinal inflammation. Mark Pennesi, MD, PhD, Casey Eye Institute (OHSU), reviewed the importance of retinal-disease natural-history studies. The benefits of these investigations include: improving the understanding of disease rate of progression and variability, identification of potential clinical-trial outcome measures, and recruitment of patients for clinical trials. Rhodopsin is the light-sensitive protein in rod photoreceptors that kicks off the visual cycle, the biochemical process that makes vision possible. Shuliang Jao, PhD, Florida International University, presented the approach of measuring rhodopsin levels in the retina — using visible-light optical coherence tomography (OCT, a light-based imaging technology) — as a biomarker for retinal function and efficacy of therapies. OCT angiography can be an effective imaging tool for measuring blood circulation in the retina, which is useful for assessing patients with conditions such as AMD and diabetic retinopathy. Brandon Lujan, MD, Casey Eye Institute (OHSU), discussed how researchers are overcoming limitations with the technique — including eye movement and head tilting — to improve quality and usefulness of images. The hill of vision (HOV) is a three-dimensional image of the retina's sensitivity to light. Travis Smith, PhD, Casey Eye Institute (OHSU), discussed how HOV can be used as a sensitive and precise measure for retinal-disease progression and effect of treatments over time. Measuring changes, improvements, or declines in people with severe vision loss from retinal disease is challenging, because they may not be able to read an eye chart nor can they maintain a stable gaze, which is required for many vision tests and imaging. Artur Cideciyan, PhD, University of Pennsylvania, discussed how tests such as full-field stimulus testing and pupillary light reflex can help clinical researchers identify vision changes in patients with substantial vision impairment. Jennifer Lentz, PhD, Louisiana State University Health Sciences Center, presented research for an antisense oligonucleotide (AON) — a piece of DNA that works like genetic tape — which rescued vision for one year in mice with a gene mutation that causes Usher syndrome type 1C (USH1C) in the Acadian population. In a different mouse study, the AON also rescued hearing and vestibular function. ProQR Therapeutics, a biotechnology company in the Netherlands, has received authorization from the FDA to launch a Phase I/II clinical trial of its AON therapy for LCA caused by the p.Cys998X in the CEP290 gene. Peter Adamson, PhD, at ProQR said the treatment, known as QR-110, was well expressed and showed no toxic or off-target effects in lab studies. The company is also developing an AON therapy for USH2A caused by defects in exon 13. Francine Behar-Cohen, MD, PhD, at the Jules-Gonin Eye Hospital and chief scientific officer at Eyevensys, presented an emerging non-viral gene therapy for non-infectious uveitis. The treatment is delivered using electro-transfection in which a pulse of electricity is used to open pores in cell membranes for gene delivery. The company is launching a clinical trial for the therapy in Europe. Casebia Therapeutics is a new company developing CRISPR/Cas9 gene-editing therapies for genetic diseases. James Burns, PhD, Casebia's chief executive officer, explained that the company is a collaborative effort of Bayer and CRISPR Therapeutics and plans to launch its first clinical trial in three to five years. Qin Liu, MD, PhD, at Massachusetts Eye and Ear Infirmary, is developing a CRISPR/Cas9 therapy for autosomal dominant RP caused by the P23H mutation the gene rhodopsin. The research team is currently working to improve efficiency of the treatment. Gerald Cox, MD, PhD, chief medical officer at Editas, discussed the company's emerging CRISPR/Cas9 therapy for LCA 10 caused by a mutation in intron 26 of the CEP290 gene. The therapy works by "cutting out" the mutation so expression of the gene returns to normal. Editas is working toward a clinical trial for the therapy. Precision BioSciences is developing a next-generation genome-editing technology known as ARCUS, a platform derived from a natural genome-editing enzyme called a homing endonuclease. The system works by recognizing, binding to, and cutting the mutated DNA. Gene Liu, PhD, who leads the company's gene-therapy development, reported that his team is currently advancing a therapy for autosomal dominant RP caused by the P23H mutation the gene rhodopsin. Sean Burns, MD, medical director at Intellia Therapeutics, discussed the company's strategies for CRISPR/Cas9 therapy development for a variety of conditions. Dr. Burns explained that the technology can be used to both cut out mutations and insert new DNA.